State Rep. Liz Pike isn’t running for county council chair any more. But she will still tell them what she thinks. Apparently that doesn’t mean she won’t show up at Clark County Council meetings to give councilors a piece of her mind about something she’s heard about that may or may not be true. At Tuesday’s council meeting, Pike showed up for the council’s public comment period. 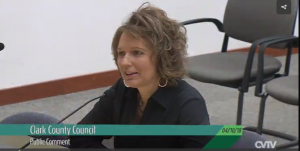 She spoke after Carol Levanen, of property rights group Clark County Citizens United, who told the council that hobby farms with horses are more economically valuable than the large lot size farms favored by the county’s current zoning. But Pike was there to talk about two other things. She was also there to talk about fireworks. “I’ve been hearing that there is a proposed ban on fireworks in Clark County, by this body or by one or two members of this body, and I just want to voice my opinion that I am adamantly opposed to a fireworks ban,” she said. She said that she doesn’t buy personal fireworks but fondly remembers her now adult twins loving them as young children. As Pike got up to go, she was stopped by Clark County Council Chair Marc Boldt. He said that there is an email circulating that claims the county is considering a county-wide ban. “That is a misleading email where a lot of that is coming from,” said Boldt. Pike asked Boldt to go on record that there is no proposed ban on fireworks in Clark County, which he did. “That’s good to know,” said Pike.